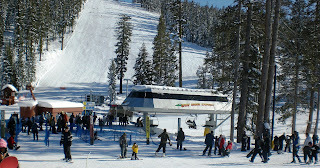 Kathy invited us to take a day trip up to Lake Tahoe for some snow sports this past Saturday. We pretty much jumped at the opportunity, and had a great time. Friday after JB got off work we went to The Ski Renter of Mountain View to pick up some gear. It was a great deal for the price, and we were able to pick-up Friday and return Sunday and count it as a one-day rental. This also kept us from losing time on the slopes on Saturday morning. It took about half an hour to get all the measurements and stuff together, and we waltzed out with a ton of stuff. I had skis and poles, boots and a bib. JB had a snowboard, boots, and a bib. We loaded the car and headed home. We booked lift tickets through Liftopia, and printed out the paperwork we'd need at the ticket center the next day. We could have gotten them a bit cheaper through my Borders Rewards Card, but you can't book at the last minute. The plan was to pick up Kathy at 4am, and we were on the road by about 4:30, so not too bad. 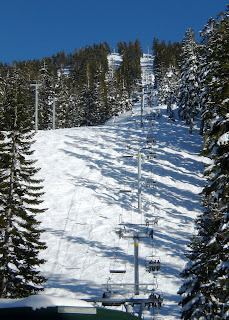 We still made it to the resort shortly before it opened, which gave us time to get on our boots and pick-up our tickets. Traffic wasn't bad, and we got great parking. We wasted no time and took the lift to the very top of the mountain. I was a bit nervous, since I hadn't skied since MLK weekend 2002. 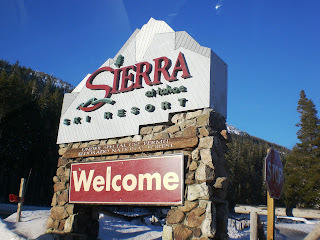 (Wish I had those pics to share, but they're only in album-format in Melbourne) Sierra-at-Tahoe was pretty nice, and a much better set-up than Winterplace, WV. At Winterplace, you had to take three separate lifts if you wanted to go all the way to the top of the mountain. Here, one lift does the trick. Although we did get kinda stuck at one point... we were headed down the mountain for lunch and our trail ended in the middle of the mountain, at a tiny lift. We had to take that up to get back down again, so it took a bit longer than expected. It's at this point I should mention that skiing and I have a love-hate relationship. I love the idea. 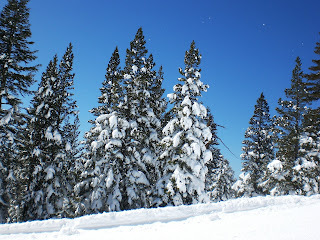 I love the snow. 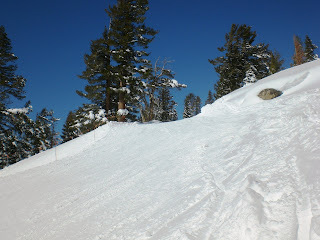 I love gliding on the snow down the hill. BUT, I hate cliffs. I hate moguls. I hate steepness. I hate going fast. And I should add that I'm pretty bad at skiing. 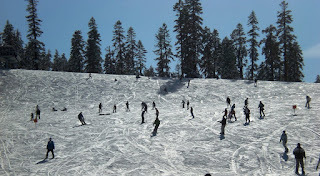 In 2002 I spent three days on the slopes, and never mastered the whole "S" thing that's kinda imperative for skiing. I managed to do a blue run (easy is green, difficult is black, and medium is blue), but it was rather disastrous. And on a green run I almost fell off a cliff... if there hadn't been one of those soft-plastic fence things, I woulda gone straight off. 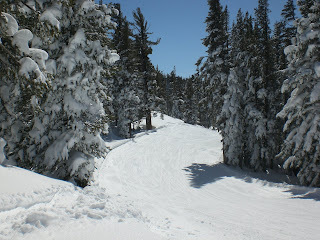 I always want to ski more, and at the same time never want to do it again. go figure. I guess that's why I love the bunny slope (pictured below)... no cliffs, no crazy speeds, and you can practice whatever you want. This time around, I did much better in a sense. I can now make VERY wide "S" shapes, but I have poor control because I can't turn fast enough. So I resort to "snowplowing" to stop the majority of the time. But, that doesn't always work, and after the snow gets packed a bit, there's a lot of skidding and getting out of control by doing that. 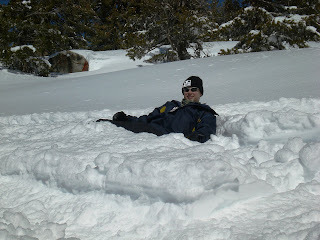 Luckily, I haven't gotten hurt, although I had two rough wipeouts this time, and two got-stuck-in-the-snowbank moments. I don't have any photos of me, but I have one of Jonathan that I took as we both fell in the same powder area (and from this fallen point a shot up the mountain and down the mountain). and next time I'll finish off the day, including a couple neat pics of people at the snowpark and the brewery we went to for dinner.